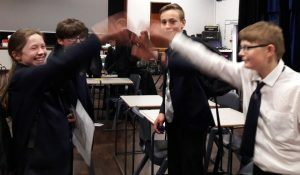 On the 19th of March four of our Y8 and Y9 students took part in the UK Maths Trust Team Challenge. 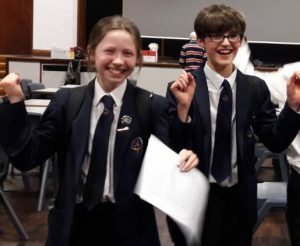 Holly Hurst (Y8), Alex Wolverson (Y8), Sam Bradley (Y8) and Ethan Owen (Y9), competed against 15 other school from around the North West in this regional heat. By completing a series of mathematical problems, puzzles, relays and challenges, they scored enough points to finish in second place! For a school of our size, competing against much larger schools, and independent and selective schools, this is an unbelievable achievement, especially given that it was the first time we had entered a team for a while. We are now waiting to hear if we have secured a place in the national finals in London! A massive congratulations to Holly, Alex, Sam and Ethan, they have done the maths department, the school, the local community and themselves proud.